The Brother DCP 7060D is an ideal printer for small to medium workplaces. The compact all-in-one printer has a fast printing speed and can print up to 24ppm (monochrome). The device uses Brother DCP 7060D toner cartridge and produces professional quality print, scan, and copy outputs. The printer weighs 22.3 lbs and measures 405w x 399d x268h mm. It has a flatbed scanner on the top and a 250-sheet input paper tray that comes out from the from side of the device. The control panel of the printer boasts an LCD display and a good range of navigation and function buttons. The maximum resolution of the printer is up to 2400 x 600 dpi. This printer is capable of handling heavy printing tasks but lacks wireless connectivity options. The separate drum and Brother DCP 7060D toner cartridge system helps you lower down your printing expenses. The Brother DCP 7060D is a great option for offices and can handle heavy printing tasks. It has a good paper storage capacity and printing speed. The printer also uses separate drum and toner system that allows you lower down your printing expenses by replacing one at a time. However, the printer also has a few drawbacks that might disappoint the users. For instance, it has only USB connectivity option and does not allow you to connect with multiple devices. What measures can be taken to improve the print quality of Brother DCP 7060D printer? Note: Usage of non-brother supplies may affect the print quality, hardware performance, and machine reliability. To get the best print quality, it is suggested to use the recommended paper. Check that you use paper that meets all specifications. Refer user manual to see the acceptable paper and other print media. Check that the drum unit and Brother DCP 7060D toner cartridges assembly is installed properly. The paper type setting may be incorrect for the type of print media you are using, or the print media may be too thick or have a rough surface. See the acceptable paper and other print media in the software user's guide. This problem generally occurs when we are low on ink, shake the Brother DCP 7060D toner cartridges gently so that the toner evenly gets distributed. A. Yes, these toner cartridges will certainly suit your printing needs. These toner cartridges are made to endure heavy-duty usage and are created focusing on accurate greyscales and smoother transitions that make monochrome images look superior on plain paper as well as select specialty media. In addition to that, these toner cartridges also enable the printer to make double-sided printouts appear sharper because they fuse and adhere to the paper quickly, and cut down on consumption of paper. Q. Will my printer print more than 1000 pages if I use Brother DCP 7060D toner cartridges in it? A. Yes; in fact, these toner cartridges will print about 2,600 pages. Q. I replaced the drum unit with my Brother DCP 7060D printer and installed new Brother DCP 7060D toner cartridges in it, but I’m getting the message “Replace Drum” and am not able to print. My drum unit is also new so why getting this message? What do I do now? Wait for the “Accepted” message on your display. This should settle the issue. Q. If I order for compatible Brother DCP 7060D toner cartridges, will I get them delivered immediately or does it take more time to ready them? A. No, most sellers guarantee next day delivery of compatible cartridges also the process of making them is completed and they are packaged just like original cartridges are. Q. Is Google Cloud Print™ compatible with Brother DCP 7060D? A. No, Brother DCP 7060D does not support the Google Cloud Print™ function. Q. I have been getting an error message ‘Prepare New Toner Cartridge’ even though I installed Brother DCP 7060D toner cartridge not too long back. What exactly could that mean? A. The error message Prepare New Toner Cartridge or Toner Low means that your toner cartridge is nearing the end of its expected life. However, the cartridge can still be used for some time. The best course of action for you is to continue using the toner cartridge till the quality of the print remains good. You can replace the Brother DCP 7060D toner cartridge when the printouts turn really faint. Q. I was advised by a friend to purchase TN2220 toner cartridges for the Brother DCP 7060D printer that I have. Could you please tell me if I should go for TN2220? A. Certainly. TN2220 toner cartridges work well with Brother DCP 7060D printers. They do a fine job as Brother DCP 7060D toner cartridges. Q. Can I take printouts on papers of different sizes with my Brother DCP 7060D printer? A. No. Please avoid putting different types of paper in the paper tray in a single printing session. It can cause paper jam or misfeeds. You can use letter and legal size paper, envelopes and thicker media for printing with DCP 7060D printer. Q. How many pages can I print with the TN2220 toner cartridge? A. TN2220 is known to print around 2,600 pages. Q. I have not used my Brother DCP 7060D printer for a while. Now it has started giving hazy printouts and the colours aren’t clearly visible either. How can I fix these issues? A. It is likely that the print head in your printer or on your cartridge is blocked. Please perform a head clean/ cleaning cycle with the software provided by the printer. The user manual will help you decide which method suits your printer the most. If that doesn’t solve the issue, you can contact Brother Support to help you out. Q. Is opting for Brother DCP 7060D toner cartridges (TN2220) a cost-effective deal? Will it cut costs for me? A. Yes, TN2220 toner cartridges are affordable. We do recommend the same for the Brother DCP 7060D printer. Q. In what way are compatible Brother TN2220 toner cartridges good for high volume usage printers? And are they classified as Brother DCP 7060D toner cartridges? A. The compatible Brother TN2220 toners yield accurate grayscales and smoother transitions which make monochrome images appear better on plain paper and select specialty media. This black toner is also able to efficiently fuse and adhere to the paper while printing, which makes it suitable for double-sided printouts too. It lessens paper consumption and cuts cost too. 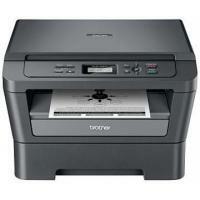 Yes, Brother TN2220 toners are very much recommendable for Brother DCP 7060D printers. Q. I have emptied a couple of Brother TN2220 toner cartridges. Can I discard them with normal domestic waste? A. No. You need to be very cautious while discarding toner cartridges. Please reseal them tightly and keep them separate from domestic waste. Follow local regulations while doing it. You may contact your local waste disposal office for assistance. Q. What is the procedure for replacing Brother DCP 7060D toner cartridges like TN2220? Turn your computer on and open the front cover. Leave the computer on for 10 minutes so it cools down. Remove the drum unit and toner cartridge assembly. Push the green lock lever down and then take the toner cartridge out of the drum unit. Take the new toner cartridge, hold the cartridge level with both hands and shake it from side to side gently so that the toner spreads evenly inside the cartridge. Take out the protective cover. Insert the new toner cartridge firmly into the drum unit ensuring it locks into place. Push down the green lock lever you’ll see there.Take the toner cartridge out of the drum unit. Set the drum unit and toner cartridge assembly back into the device and remember to close the front cover.